Many websites have a number of reasons to incorporate the display of various charts and graphs in their presentations and content. 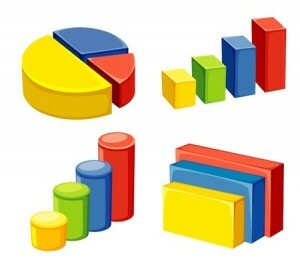 In the past, charts and graphs were a great way to accentuate data and help clients and employees recognize the trends in various elements of business. As a content creator in the modern world, however, you may find that graphs and charts can help you more effectively sell a message or convey an idea to your audience. Unfortunately, many people make the mistake of including too much information in their graphics or having style options that clash with the simplicity that these forms of data should offer. Below, we will discuss some tips that can help you clean up your charts and help make them more enjoyable by just about anyone. When you are pinging URLs of content to search engines or via marketing, you want to ensure that the data being presented is simplistic in terms of presentation. While in many other cases it makes sense to use a variety of frills to attract an audience, a patterned or otherwise clashing background can make your data harder to interpret and distract users in the process. Instead, use transparent or white backgrounds to ensure that people are focused on your data. With a clean, simplistic background, you build the base for an effective graph or chart that will convey the message as intended. This may seem like a style no-no, but borders are another distraction that can clash with the design and substance of your charts and graphs. With a simplistic background coupled with this approach, you can ensure that no elements of design are distracting your audience. The data should be able to explain your messages and convey itself without tons of frills; most people who are interested in subjects and formats such as charts and graphs want to be able to sort through the information as quickly as possible. Sometimes, bloggers and content creators think it wise to add effects to their data-sets in order to spice things up. This, unfortunately, is unnecessary and can make the data more difficult to discern. Graphs and charts gain popularity via sharing because they are easy to understand, not because they are pretty (unlike many other forms of imagery). This includes duplicate labels and shadowing effects. All of these extra elements are distracting and will cheapen the effect that the data has – you want the data to be the selling point above all else. Any properly designed graph or chart will seek to simplify the transmission of information so that users gain the most from it in the least amount of time. When you are pinging URLs on social media or via your blog, it is imperative that the data appears to be easily discernible so that more people will explore and share it. If you are unsure how to accomplish this, then you can gain the basic merits outlined here by eliminating borders, intricate backgrounds and special effects.